One of my goals next year is to improve upon and expand our existing Digital Citizenship model. So I’m excited to attend Exploring Digital Citizenship with Google with Craig Leach. Any school that incorporates technology needs to include meaningful, digital citizenship. In conjunction with Common Sense Media, he has been developing a Digital Citizenship Course. He starts by telling us to explore Digital Citizenship in our backyard. It’s never hard to find stories about digital presence resulting in negative consequences. He provided us with 5 local stories that we explored, ranging from cyberbullying to student arrests. We engage in group discussions about the themes behind these topics. One element that I noticed is that schools are so focused on being reactive to these events instead of preventative. Dealing with incidents of cyberbullying or bad behavior online necessitates a broader educational program, including teachers, students, and parents (who are often left out). It needs to be consistent and pervasive education; if you are focusing on Facebook behavior, then you’re not preparing for the next tool. These incidences and events expand outside of the Classroom. We next explored the definition of Digital Citizenship. Common Sense Media defines Digital Citizenship is “The ability to think critically, behave safely, and participate responsibly in our digital world.” An approach to digital citizenship needs to include balance: powers and perils. So you should talk about ready access to media, but also address copyright infringement. When Craig got a classroom set of iPads, he created some digital expectations and classroom guidelines for technology use. His acceptable use policy included protecting the devices as well as appropriate behavior inside and outside of the classroom. He recommends having students build their own policy in their own words. We talked a little about Google Searching; show them how to find effective sources and assess it. He recommends that you explore google search tools and advanced search features. Navigating and negotiating online tools is important. By using Google Research tools, especially features like “search by license,” you can engage students in conversations about licensing, copyright, and plagiarism. One of the great things about Google Tools is that they allow you to to instigate a number of empowering conversations about online engagement. This entry was posted in Education, Educational Resources, Educational Technology, Google, Technology and tagged Ed Tech, EdTech, Education, Education Technology, GAFE, GAFE Summit, Google, google apps, Google Apps for Education, Technology on April 10, 2015 by Jennifer Carey. The next session I’m attending is Design Playground with Google Drawing, by Ken Shelton (the keynote speaker). While I’m familiar with Google Drawing, I have never seen it meaningfully applied, so I’m excited to learn something new. Ken begins his workshop by telling us how Google Draw can be used for within a rich pedagogy. The first thing he points out is that there is a lot of cross over from other Google Tools (Docs, Sheets, etc) as you can share, comment, and a few other things. We start by inserting our first shape, a rectangle! It’s easy, just click, drag, and draw. I manipulate the image by changing the color of the image and the line; you can even play with the weight of the line. We drew another rectangle, but this time we held down the shift key. This time, it aligned the shape and drew a perfect square. He shows us a few different shortcut tricks that you can find here. After we have mastered shapes, we next get to play with spatial relationships! How do shapes work together? What’s the differences between cross and intersect? Touches and connects? Overlap and Overlay? So now we get to play again by scaling our shapes up or down and then creating different spatial relationships. I create a square and then insert a circle and then an equilateral triangle. By using the guidelines that appear, you can perfectly align these shapes; you’re trusting not your eyes, but the program! By using the Arrange –> Order feature you can select which shape overlaps the other one. By playing with the alignment, order settings, and color and line settings, I can create an ice-cream cone with a cherry on top! Even though this drawing was simple, I had to play with size ratio, resizing, and manipulate color. Next, by selecting Arrange–> group, all of these shapes are now one! I can resize and align as a single design. The possibilities of layering provide a a world of opportunities – students can create graphics and other designs (like infographic tools). I have to admit that this is far more flexible than I thought. I can certainly think of some ways to apply this. There really are some cool tools, and it’s not just the red-headed step child of Google Apps. This entry was posted in Education, Educational Resources, Educational Technology, Google and tagged Education, Education Technology, Educational Technology, GAFE, GAFE Summit, Google, google apps, Google Apps for Education on April 9, 2015 by Jennifer Carey. I am so excited to be in Los Angeles at the Google Summit at Harvard Westlake. Harvard Westlake is not only a great school, but my good friend Moss Pike (follow him on twitter) is organizing this conference! The Keynote Speaker is Kenneth Shelton. His topic is “Why Technology Matters.” Ken tells us that he wants to use this time to discuss how we identify the word “technology,” how students use it, and how it can and should be used. He says that he looks at technology as a way to accelerate learning. It doesn’t make a bad teacher good, but it allows a good teachers to become better! 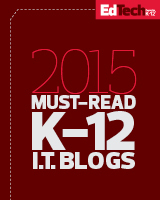 One of the greatest hurdles facing educators in technology is anxiety. On the other side are teachers who can’t get enough technology (self-identified)! Ken next shows us a series of images that can all be identified as “technology,” things like: bicycles, erasers, stoplights, etc. Technology doesn’t have to involve electricity or plugging in. So he asks us “what is one word that highlights how we feel with technology” and shares a tinyurl for us to submit our thoughts via a Google Form. Ken shows us some of the responses which range from “frustrating” to “empowering.” I personally feel that technology itself is neutral, it’s how you use it. Digital Immigrants vs. Digital Natives – this has been a popular concept in the realm of educational technology and I’m happy to see Ken knock this one out. I find it frustrating and an unnecessary barrier. We all grew up with technology, it has just changed. Additionally, just because a student knows how to post a status update or search a map doesn’t mean that they can harness it effectively. It’s Easier than it Looks – Technology use is not the same as effective use. For example, we don’t give students the keys to a car without driving lessons. It looks easy, but it’s not. We cannot just give kids tools and then let them run. Kids may be better at figuring things out, but that doesn’t mean they can use it meaningfully. It’s Harder than it Looks – Technology has become more user friendly and there are numerous resources to learn how to use them. Blooms Taxonomy – Ken steps into controversial territory when he says that Blooms Taxonomy is a myth. It shifts regularly and requires a strict protocol and hierarchy. Ken states that in the digital age they are no longer hierarchical, you can create to understand without going through remembering. You can blend creating with application and understanding. You don’t have to follow it from the bottom up. Advantage of NOT Knowing – When you are in the creation phase, you have a million opportunities for an outcome. You have an advantage of not knowing and thus can explore. We are used to getting the result we are looking for, we get frustrated. When this happens in the classroom, we try to shield our students from knowing that. There are millions of possibilities and we should embrace it! By focusing on the result that we want, you ignore the thousands of other possible options and outcomes. If you embrace change, then you can do many more things than you envisioned. Strong Meaningful pedagogy hasn’t changed. What has changed, is how we can incorporate meaningful tools and processes into our classroom. Do we embrace innovations or do we stick to our old ways? You have to try the new thing and adapt. The more you experiment with new tools, the better you get at them. We have a fear of trying something new; we don’t want to fail or stumble. However, if I knew that everything would be the same in 5 years I would be horrified. We have to try new things while stumbling along the way. I really think that it is necessary to discuss our reaction to people’s online behavior. Does an errant tweet really necessitate a public shaming by millions of people worldwide? Is this a new version of cyber bullying? In addition to discussing what to post online, it’s a good idea to talk to students about contributing meaningfully. Do we need a million cat videos? Probably not… When my students create something often, I do like to encourage them to put it out there – build your own portfolio of what you want others to see. Kids are making stuff and putting it out there all of the time. Are we discussing with students and parents what they are putting online? Let’s talk about responsible use! We need to support students, parents, and teachers to use technology in a responsible and product manner. If we don’t support our stakeholders and give them support, then we are setting them up for failure. The tools are important in that we must use them meaningfully. The last component of why technology matters is to plant the seeds of intellectual curiosity. Technology can open up new worlds for students in a responsible manner and build a sustainable model of motivation. 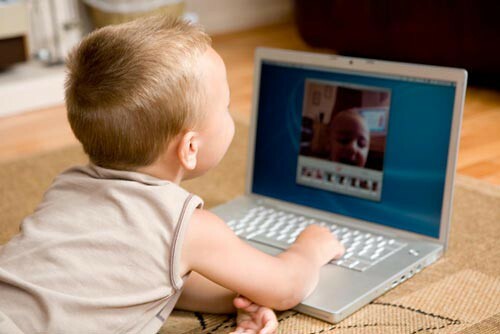 Technology can give students a voice; children that are shy or struggle with communication skills can harness new technologies in powerful ways. Students can make their thinking visible, show their work, and create a powerful narrative. This entry was posted in Education, Educational Technology, Google and tagged Education, GAFE, GAFE Summit, Google Apps for Education on April 9, 2015 by Jennifer Carey.